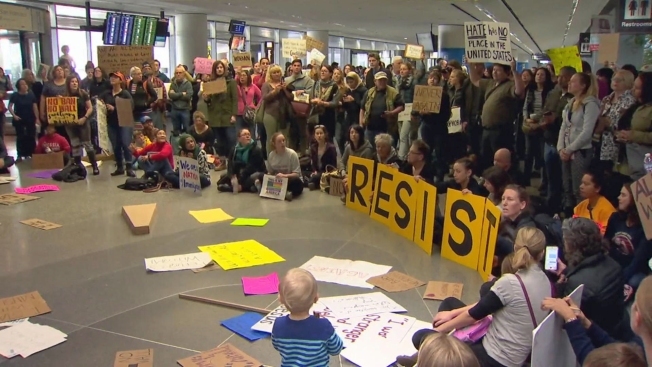 Droves of protesters on Sunday flocked to San Francisco International Airport for the second-consecutive day to condemn President Donald Trump's immigration executive order. 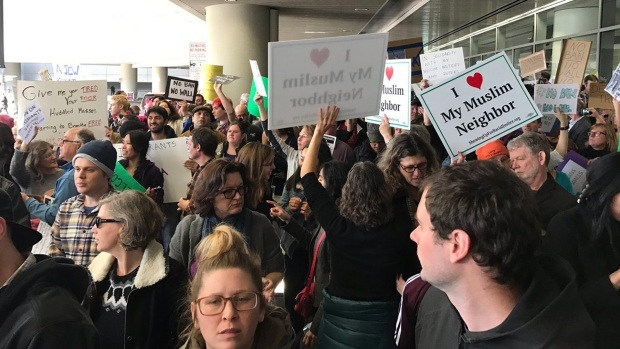 Frustrated folks, who brandished an array of signs ranging from "Refugees and Immigrants are Welcome" to "No Ban, No Wall," began gathering at SFO's International Terminal at noon to echo the same message voiced on Saturday: Stop the travel ban. Free legal assistance for families of detained travelers was also offered by a number of lawyers on hand. Flocks of protesters on Saturday converged on the San Francisco International Airport to voice frustration with President Donald Trump's immigration order. Christie Smith reports. The president's controversial decree temporarily closes the United States to people arriving from seven Muslim-majority countries as well as bars entry to refugees for four months and Syrian refugees indefinitely in hopes of preventing extremists from carrying out an attack on American soil. The controversial mandate sparked a host of protests on Saturday at airports across the country after some refugees and other immigrants from the Middle East and Northern Africa, including a student from Stanford University, were detained at various airports and questioned for several hours. Protest efforts received a boost late Saturday when a federal judge ruled in favor of a temporary stay to prevent people with valid visas being held at airports from being deported, but the work is not done yet for those frustrated with Trump's stance on immigration and the treatment of refugees. Hundreds of protesters of all ages at SFO on Sunday joined in unison and chanted "Build bridges, not walls," "No hate, no fear, refugees are welcome here," or "Let the lawyers in, let the families out." Among those in the crowd was Hector Perez, a concerned immigrant himself. "I'm an immigrant and so is my wife," he said. "I have a lot of my family in this country. Some of them are here illegally. I'm very worried." Jihad Elattar, 11, was born in the United States to Egyptian parents. She braved the protest and flashed a sign reading, "Yes, I'm a Muslim. No, I'm not a terrorist." Despite living in a divided country, the youngster was amazed to be enveloped by open arms. "I'm so surprised all these people are here," she said. "I really feel like people are here for me." A Sudanese graduate student from Stanford University was among those on Saturday held at JFK Airport in New York City following the implementation of President Donald Trump's executive immigration order, which temporarily banned citizens from seven Muslim-majority countries from entering the country. Chuck Coppola reports. Local U.S. Customs and Border Protection agents notified airport authorities that four individuals who were detained on Sunday as a result of the executive order were released as of 1 p.m., airport spokesman Doug Yakel said. A fifth and final traveler was released at some point before 3 p.m. 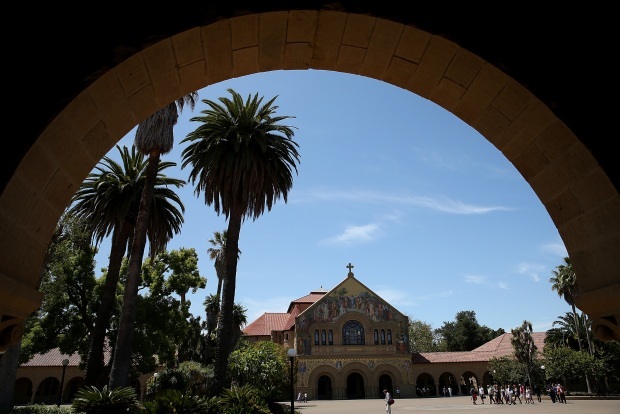 It's hard to know exactly what's going on behind closed doors because lawyers are not being allowed to talk to detainees, according to Christine Lin, a senior staff attorney and managing attorney for the University of California's Center for Gender and Refugee Studies. Sensing a need for assistance and answers, San Francisco-based lawyers Jasmine Blackmeir and Chris Cadena made the short trip to the airport to offer whatever expertise they could to impacted travelers. "We're looking for families that are waiting for their family members getting off flights from London and Frankfurt," Blackmeir said. "London and Frankfurt have been letting people board from the seven countries. There has been so much confusion at airports and so we think that you're actually going to have more people detained later this afternoon." Amid the protests, Trump himself issued a statement, asserting his executive order is not a "Muslim ban." "To be clear, this is not a Muslim ban, as the media is falsely reporting," the statement read. "This is not about religion — this is about terror and keeping our country safe." The Department of Homeland Security on Sunday tweeted that the agency "will comply with judicial orders; faithfully enforce our immigration laws, and implement (Trump's) executive orders." DHS officials also tweeted that the executive order only "affects a minor portion" of international travelers. Trump's aides claim the order has little impact. Hundreds of protesters in San Francisco on Saturday didn't seem to agree with those sentiments. They clogged the airport's arrivals section before spilling into the International Terminal. Some of the signs flashed throughout the hours-long protest included "#NotInOurName," "#NeverAgain" and "I Stand with Muslim Travelers." A number of day-two protests also cropped up around the state of California, ranging from Los Angeles International Airport to Sacramento International Airport. Protests also erupted across the country in locations such as New York City, Philadelphia, Chicago and Miami. 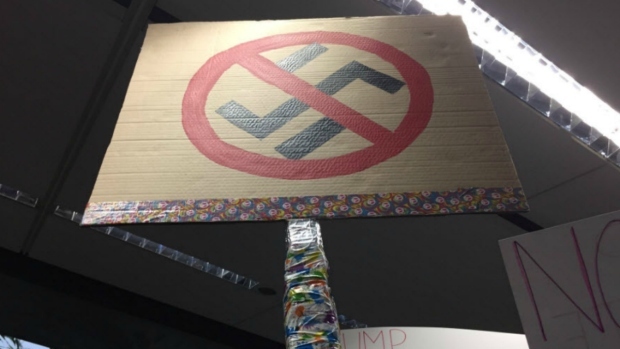 Protesters at SFO said they continue through the night and be back at noon MOnday, and one organizer said the protests will not stop until Trump lifts his order.